Specifically designed to eradicate downdraught, the Rotorvent Turbolite stainless steel spinner cowl by Colt Cowls will assist ventilation with its innovative rotating action. Designed and manufactured in the UK, this Rotorvent cowl offered by JJ Roofing will fit chimney and flue sizes up to 250 millimetres. A strap fixing kit will be include with each purchase that will make the installation of this stainless steel solution straightforward and simple. The Rotorvent Turbolite by Colt Cowls improves on the aerodynamics of the previous versions making it even more efficient. Possessing the same high specifications as the original, you can rest assured that you are still receiving the highest quality solution available on the market with the Rotorvent cowl. 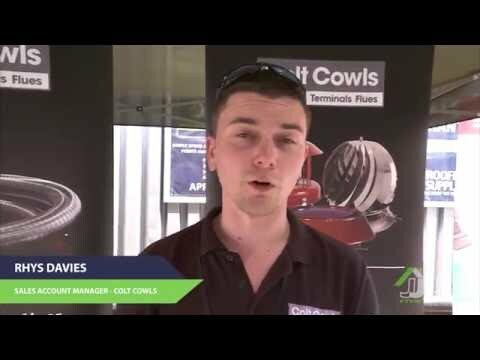 The fin fixing method that Colt Cowls has been utilising for years has not changed and the fins are still made from the highest quality stainless steel available in the industry. The base is manufactured from die cast aluminium which provides a tough durable finish that is guaranteed to last for many years to come. A new manufacturing method has enabled Colt Cowls to make the base 30% lighter than the original version without sacrificing the strength. The legs are thinner, rounder and aerodynamically designed for a superior performance. When you purchase the Rotorvent Turbolite by Colt Cowls, you will have the choice between two different fixing methods. The preferred way of installing it is the classic hook bolt, however a strap fixing kit will be included with each purchase for an alternative solution. The new lighter weight means that this Rotorvent cowl can also be installed on top of flue systems as well as traditional chimney pots. The strap fixing kit will give you some extra security which makes it especially suitable for areas that experience high wind speeds. You can easily attach the legs underneath the wingnut, then drop down the outside of the chimney pot, finally fastening the jubilee clip. Colt Cowls has a well-established reputation for creating the best quality chimney cowls and bird guards available in the UK. With more than 80 years of industry experience, you will be hard-pressed to find a more knowledgeable and innovative manufacturer anywhere – more than 4 million Colt Cowls products have been sold since their inception in 1931.